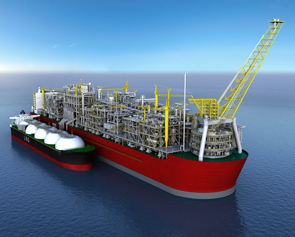 We believe that floating liquefied natural gas (FLNG) will write the next chapter in the history of the industry. In the coming years, Shell will start to produce and liquefy natural gas at sea, enabling the development of gas resources ranging from clusters of smaller and more remote offshore fields to potentially larger fields. FLNG can open up new business opportunities for countries looking to develop their natural gas resources. In May 2011, Shell announced the world’s first final investment decision to build an FLNG facility. The facility will be used to develop the Prelude gas field, 200 kilometres off Australia’s north-west coast (see also Key projects update). Prelude FLNG is the first of what we expect to be multiple Shell FLNG projects, and builds on our existing capability and LNG leadership.